Kevin Doherty has taken charge of Institute on an interim basis following the departure of manager Paddy McLaughlin. Doherty, a regional grassroots development officer with the IFA, was part of McLaughlin’s back room team and will act as head coach until a permanent manager is appointed. McLaughlin succeeded Barry Gray as Cliftonville manager on Monday. Stute sit seventh in the table, 15 points above bottom side Ards. 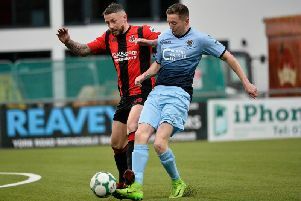 McLaughlin’s assistant Brian Donaghy and coach Conleth McCrudden also stood down from their positions earlier this week while captain Michael McCrudden said he would not play for the side again having signed a pre-contract with Derry City.